I love the community gathering on the Hypothyroid Mom Facebook page. One of my readers named Samantha wrote that when her doctor discovered her sky high TSH levels, he responded, “You hypo’d like a rock star!” Now you know I couldn’t get that image out of my mind. A common scenario with Hashimoto’s is one in which the thyroid condition fluctuates between being underactive and overactive. 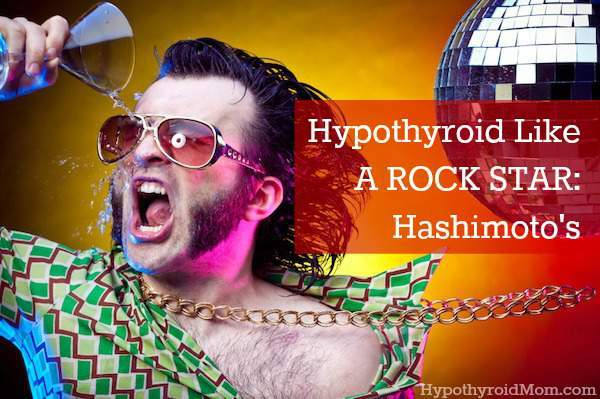 For these Hashimoto’s sufferers, their symptoms fluctuate from hypothyroid to hyperthyroid and back again and forth like a rock star partying hard then crashing with a hangover then partying hard again. Their TSH swings up and down like a rock star gone wild! Hashimoto’s thyroiditis is considered the number one cause of hypothyroidism in the US, yet thyroid antibodies are often NOT tested. There may be readers here right now reading this article with Hashimoto’s and they have no idea. Hashimoto’s disease is an autoimmune condition in which the body attacks and destroys its own thyroid gland. Piece by piece your body chews up and destroys your own thyroid gland as if it is the enemy. In a healthy immune system, antibodies act as the body’s army to detect and destroy invaders not normally present in the body, such as bacteria, viruses, fungi, and parasites. In the case of Hashimoto’s disease, a defective immune system wreaks havoc on the body by directing antibodies against its own thyroid gland as if it is a foreign invader. A Hypothyroid Mom reader left this comment on my Facebook page that was so important it stuck in my mind for months. When you have one autoimmune disease you are more likely to develop others. After researching in 2009, I asked to be tested for Tg-Ab, TPO-Ab, and TSIG, the 3 thyroid antibodies. All 3 of mine were very high. I also asked for T4 Free, T3 Free. Both of mine were very high. I also asked for these tests (lupus/sjogrens): ANA, ANA Patterns, SSA Antibody and SSB Antibody. My ANA was 1:640, pattern was speckled, and positive for SSA. I was dx with Graves’ disease, Hashimoto’s, and Sjogrens. Later, I asked for these tests: DQ ALPHA 1, DQ BETA 1, GLIADIN AB, IgA and GLIADIN AB, IgG. All came back positive, which means I have the pair of Celiac genes and gluten sensitive. Research your symptoms, find the possible diseases you may have, research the labwork for those diseases and politely insist your doctor runs the lab work for you. Dr. Gerald Mullin from Johns Hopkins says statistically somebody with an autoimmune disease is at risk of a total of 7 autoimmune diseases in his or her lifetime. If nothing is done to calm down the autoimmune attack on your thyroid gland, the risks are high that your immune system will then begin attacking other parts of your body. You become vulnerable to develop other autoimmune diseases. Mary Shomon provides an Autoimmune Disease Checklist, a list of symptoms that can point to different possible autoimmune conditions to bring to your doctor’s attention. Many readers have contacted me suffering from multiple autoimmune diseases in addition to common hypothyroidism symptoms, yet their doctors have NEVER tested their thyroid antibodies. There are two thyroid antibodies for Hashimoto’s to test: Thyroid Peroxidase Antibodies (TPOAb) and Thyroglobulin Antibodies (TgAb). Elevated antibodies above normal for either of these antibodies is used for diagnosis. If your doctor refuses to test your thyroid antibodies, you have the option to order your own thyroid lab tests. True Health Labs is a trusted place where you can order comprehensive thyroid testing including thyroid antibodies and more. The advantage of True Health Labs is that they offer one-on-one results review with one of their Functional Medicine doctors so that you understand your lab test results and next steps. I asked for a special group discount for Hypothyroid Mom, so use coupon code Limited_5 for 5% off an order. If you have a Flex Spending Account (FSA) with your employer, all lab tests ordered online at True Health Labs are FSA-friendly. Many readers have written to say their thyroid antibodies are sky high but their doctors refuse to treat them because their TSH is “normal”. This is particularly disturbing given that in the early stage of Hashimoto’s TSH can be normal while the immune system continues attacking the thyroid. As well, for Hashimoto’s sufferers who cycle up and down with fluctuating TSH levels, their doctor may happen to test their TSH at the low point in the swings and mistakenly determine TSH is “normal”. Mary Shomon, author of Living Well With Hypothyroidism, wrote a great article about preventative thyroid treatment for treating antibodies when TSH is normal. It’s a controversial subject, and many endocrinologists will simply dismiss you if you ask about it. But new research has been published that supports the understanding that autoimmune Hashimoto’s disease may be preventable, slowed, or even stopped entirely before it progresses to destruction of the thyroid gland and hypothyroidism. The standard care for a Hashimoto’s patient is to simply wait until the immune system has destroyed enough thyroid tissue to classify them as hypothyroid, and then give them thyroid hormone replacement. If they start to exhibit other symptoms commonly associated with their condition, like depression or insulin resistance, they’ll get additional drugs for those problems. The obvious shortcoming of this approach is that it doesn’t address the underlying cause of the problem, which is the immune system attacking the thyroid gland. And if the underlying cause isn’t addressed, the treatment isn’t going to work very well – or for very long. There is more to treating Hashimoto’s than thyroid hormone replacement medication. Optimal thyroid medication of course is an important part of a person feeling well but in the case of Hashimoto’s there is more to consider. Hashimoto’s is more than a thyroid condition it is an autoimmune condition. There are many possible underlying triggers for that person’s autoimmune condition that need to be checked. There is controversy over whether natural desiccated thyroid (NDT) is an ideal treatment option for Hashimoto’s. Some suggest that NDTs are derived from pig thyroid which is biologically very similar to the human thyroid gland. The thinking goes that if your immune system is attacking your thyroid gland then adding a drug that closely resembles it would worsen the condition. While the opposing camp says that NDTs are a great option for Hashimoto’s sufferers. I personally hear from many Hashimoto’s patients at Hypothyroid Mom doing great on NDTs then others say they feel better on synthetics. We’re all individual. The key is finding a doctor who will explore the thyroid drug options to find the treatment that works best for YOU. Dr. Alan Christianson, author of Healing Hashimoto’s: A Savvy Patient’s Guide, provides this description of Hashimoto’s. B12 with vit d, dietary folate together should correct thryroid function.aso check haptocorrin r binder ,trascobalamins and intrinsic factor re absortion as some people are okay on in active b12 hydroxy cobalamin and some need the active form methylcobalamin.enzymes are also very important quercertin helps inflammation for example and digestive enzyes tripsin, chymotripsin for example for gut health.include apple cider vinegar,grapefruit,bicarbonate soda and lemons in you diet. Hi Dana, do you have any experience with dessicated thyroid supplements? I live abroad and have never been able to get my hands on NDT like Armour, but am experimenting with dessicated bovine supplements. However, the ones I have are not labeled with the contents of T4/T3. I’m also curious if taking NDT triggers an autotimmune response in people with Hashimotos? Hi, Neal, you didn’t mention which country you’re in, but depending on that, you may be able to order porcine NDT from Thailand without a prescription – unless you prefer bovine? I didn’t even know that bovine NDT existed until I read your post. I’ve never heard of NDT causing an autoimmune response, but, if someone is allergic to pork, common sense would indicate tempting fate would not be prudent. In that event, I’d suggest finding safer, non-allergenic alternatives.